The 17th Annual Bouse Hills Muzzle Loaders Rendezvous will be held on February 13-16, 2020 at the La Paz County shooting range, outside Bouse, Arizona on Highway 72. The public is invited and there is no admission fee. Spectators will be allowed to try their hand at black powder shooting and a special shooting area will be reserved for them. Experienced club members will assist spectators who want to experience black powder shooting under watchful supervision. Participants will be in the dress of the fur trading era. Members will be available to explain their outfits and give historic overviews of the era. Visit the Bouse Hills Muzzle Loaders Rendezvous and take a step back in time to the pre 1840s fur trade era. 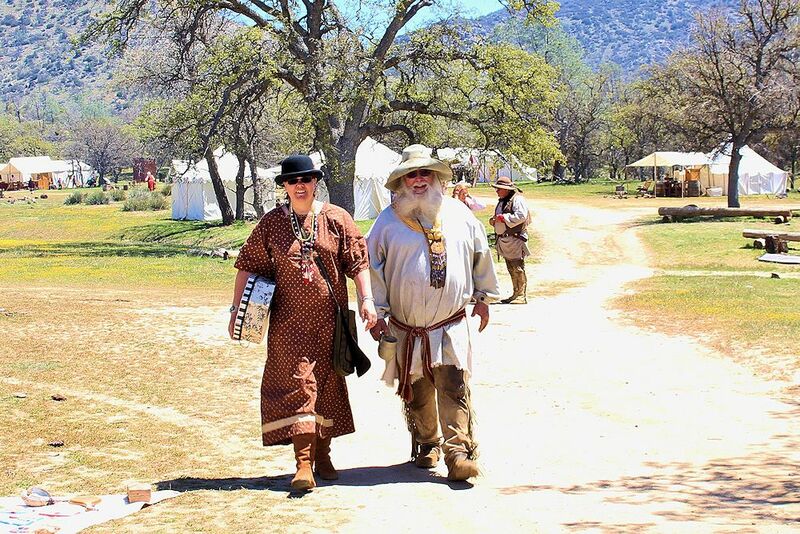 Thousands of shooters and spectators are expected at this year’s family-friendly Bouse Hills Muzzle Loaders Rendezvous to experience the sights, sounds and smells of a mountain man rendezvous. A food vendor will server breakfast, lunch and dinner on site. There will be demonstrations on Saturday of primitive skills such as flintknapping ad tatting. Many rendezvous participants will be dressed in clothing representing the 1820-1840s Fur Trade Era. Shooting, hawk and knife throwing and other competitions will take place from Thursday through Sunday morning, with an awards ceremony Sunday afternoon. Competitors shoot round ball, muzzle loading firearms, both rifle and pistol. No inline firearms are allowed. The club will hold a Rendezvous Raffle and you do not have to be present to win. The food vendor will be back serving breakfast, lunch & dinner. Shooter Fees: $15.00 per shooter or $20.00 for a family plus one nice shooter prize from each shooter of $10.00 value or more, something you would like to receive. Camping (Opens Tuesday): $5.00 per night camping fee charged by La Paz County Parks and Recreation. Pets allowed, but must be on leash at all times. BHML will have “primitive” and “tin teepee” sections for anyone wishing to camp that weekend to participate in the competitions. Trade Blanket & campfire begins around 6:00 PM near Registration. Bring items to trade. Musical entertainment. For club members, participants, and their guests. Your ticket to attend is a potluck dish – each dish should feed 6 people. Club will provide plates and silverware. A Square Dance will follow the Pot Luck so come prepared. Sutlers (vendors) are required to donate a prize worth $10.00 or more to the Raffle Drawing. This will be taken at the registration booth. Plus a $10.00 vending fee per vendor will be collected by La Paz County Campground Host. Sutlers (vendors) will sell period appropriate merchandise to participants and visitors. Shooter prizes will be awarded for the weekend aggregate consisting of: Rifle Trail, Rifle Paper, Pistol Trail, Pistol Paper, and Hawk & Knife scores. Up to 25 points will be added to your weekend total for period clothing. The Rifle Trail Walk consists of about 20 targets scattered around a large area of the range. Shooters walk to each target ranging from 25 to 100 yards away from the trail. At the end of the rendezvous, the three highest scorers receive a first, second or third place award. Pistol Trail Walk is the same as the Rifle Trail Walk with only 11 targets. The three highest scorers receive a first, second or third place award. One of the shooters favorites is The Running Buffalo. It consists of a wooden buffalo target that is attached to a cable. The cable is held up by poles at both ends of the course. There is a battery that moves the cable to make the buffalo appear to be running. The shooter closest to the “heart spot” wins. Fort Shoot – A team of four shooters all shoot at once to defend the fort from behind a wooden fort structure for 10 minutes. A variety of items make up the targets that are placed in rows of various distances from the structure. The targets carry different point values, depending on their distance away from the fort. The goal is to hit as many targets as possible in the 10 minutes to increase the team’s total score. A personalized certificate is awarded to each member of the winning team, with a picture of the team on it. Stake Shoot – Teams made up of three shooters alternate fire at their own 2×4 stake. All teams are shooting at once. The winning team is the first team to cut their stake in half. Each member of the winning team receives a certificate with the team’s picture on it. Hawk & Knife Throw – The participant throws a tomahawk and knife at targets on palm stumps with varying degrees of difficulty. The highest scorer receives an award. Rendezvous events support, promote and preserve the nation’s historical heritage in the sport of muzzle loading through recreational, educational, historical and cultural venues such as match competition, hunting, gun making and safety, historical re-enactments, exhibits, museums, libraries, and other related programs. Events such as the Bouse Hills Muzzle Loaders Rendezvous also informs the public on the heritage of early American firearms. Mark your calendar today so you don’t miss the Bouse Hills Muzzle Loaders Rendezvous at the La Paz County Shooting Range on the third weekend in February (THU-SUN) in Bouse, Arizona.